As the Chair of the SPring-8/SACLA Research Results Review Committee (hereinafter, “the Committee”), I was asked to write this article with the aim of providing users a better understanding of the activities of the Committee. The research results publication system has been finally completed with the decision that users cannot, in principle, request a re-reextension of publication of research results and are required to submit a manuscript to SPring-8/SACLA Research Report. Taking this opportunity, I would like to express my own personal view that cannot be fully represented by the rules of the system rather than articulate an official opinion of the Committee. For an overview of the research results publication system and the details of deadline extension, refer to the article written by committee member and editor, Dr. Noda. In this article, I will share my thoughts with the hope that they will help you gain a better understanding of this system. First, in this article, I will discuss a concept that apparently has nothing to do with the Committee. It is often said that synchrotron radiation science is “small science at a big facility”, but I have never agreed with this opinion. For me, synchrotron radiation science is always “big science”. This way of thinking leads to a lot less stress for me. Those who are involved in synchrotron radiation science may encounter a number of frustrations such as “Why should I take the trouble of submitting a proposal for just a small amount of beamtime?”, “Why do I have to report research results to the facility?”, and “Why should I accept the position of a Committee member (or the Chair of the Committee)?”. Under these circumstances, there will be a lot more whys if you consider yourselves involved in small science. With the idea that synchrotron radiation is big science, I am less stressed and enjoy contributing to the development of big science. Many people are engaged in various activities in a giant facility such as SPring-8/SACLA. There are committees, such as the SPring-8 Proposal Review Committee, with which users are familiar. 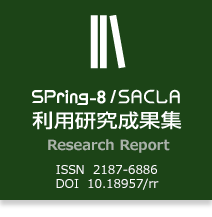 In this article, however, I would like to provide information about the activities of the SPring-8/SACLA Research Results Review Committee that may be less visible to users. 2. What is the SPring-8/SACLA Research Results Review Committee? The following is a brief introduction to the role of the SPring-8/SACLA Research Results Review Committee. As you know, the importance of the publication of research results obtained at SPring-8 increased markedly on 27 October 2010 when the “Recommendation from the SPring-8 Selection Committee regarding the Promotion of Publication of Research Results” was published. It became necessary for all approved nonproprietary proposals to yield some results. This was the biggest change in the history of SPring-8, but I will not discuss here the pros and cons of this change. As a means to realize this revolutionary change, JASRI decided to launch the publication of the SPring-8 Report (tentative name). Currently, it is regularly published as an e-journal, SPring-8/SACLA Research Report (hereinafter, “the Research Report”). I understand that it was necessary for SPring-8/SACLA to publish its own journal in order to reach the major goal of obtaining research results from every nonproprietary proposal. The SPring-8/SACLA Research Results Review Committee was established to assume the primary responsibility related to the Research Report, although the ultimate responsibility lies with the President. First, there was only the above-mentioned Recommendation but no specific guidelines for the Committee. We have continued to publish the Research Report while making important decisions about the style and format of the journal, how manuscripts are refereed and edited to be published in the Research Report, how users can request an extension of the deadline for the publication of research results, whether it is necessary or not to grant a request for re-extension of the deadline, and, if necessary, how users can request it. We have developed the research results publication system while dealing with various issues. Now the system has been completed with the decision that users cannot request a re-reextension of the publication of research results and are required to submit a manuscript to the Research Report if they were unable to publish their research results in a journal article during the re-extension period. Because users who are granted a re-extension will have seven years from the end of the research term, I believe that they will be able to agree to report, in some form, the progress of their research by the end of the re-extension period. The current biggest problem of the Committee is that some project leaders are out of contact. Under the current research results publication system, a new proposal submitted by a project leader will not be accepted if the research results of an approved proposal submitted by the same project leader have not yet been published. For example, if a project leader does not request a deadline extension or contact us even after the three-year deadline of an approved proposal, any new proposal submitted by the same project leader will not be accepted. The new proposal will be properly accepted when the project leader requests a deadline extension for the previously approved proposal with an expiring deadline or publishes and registers the research results of the previously approved proposal. The new proposals that cannot be accepted are called blocked proposals for the sake of convenience and are a major source of concern for the Committee. The Committee repeatedly endeavors to contact the project leaders of blocked proposals through the Office. We, however, have received no response from some of those project leaders up to now, even though these project leaders have submitted a proposal and actually carried out experiments. This was very difficult for me to understand and the majority of users who regularly use this facility probably cannot imagine why this happens. Experience shows that most of these cases are related to personnel rotation. Those project leaders carried out experiments at SPring-8, but their current job has nothing to do with synchrotron radiation. The Committee is also trying to follow up such cases, but there is virtually nothing we can do when they are out of contact. There are also other minor problems. Thanks to the cooperation of most users, however, the research results publication system is generally working well as its online system has been completed, a digital object identifier (DOI) has been assigned to the manuscripts included in Research Report, the time to publication of research results has been shortened since the start of this system, and the number of published research results has been growing. The publication of the Research Report started as described in Section 2. The Research Report is slightly different from other journals. To understand the difference between them, think of a proposal whose research results cannot be published in a journal article. In our system, the research results of approved proposals should be published in a journal article or other media within seven years after the end of the research term including extension and re-extension periods. In some projects, multiple proposals should be carried out before publishing the research results in a journal article. Users may bring together in one publication the research results of multiple proposals. If seven years have passed without yielding publishable research results, users cannot, in principle, request a re-reextension and are required to publish the research results in a journal article or to submit a manuscript to the Research Report. On reading this, most of you will probably point out a contradiction, saying, “They could not publish their research results in a journal article because they could not produce research results, so how can they publish their research results in the Research Report?” In my understanding, there is a slight difference between the research results published in a journal article and those published in the Research Report and this difference may be the cause of the apparent contradiction. In the case described above, what is required of users is to summarize their ideas, experiments, results obtained or not obtained, and their opinion at that time into a manuscript and submit it to the Research Report. Such a manuscript is considered to contain research results that are publishable in the Research Report. This is how the research results published in the Research Report differ from those published in a journal article. There is no contradiction between them because, from my own perspective as the Chair, the Research Report is designed to focus on the research activities carried out at SPring-8/SACLA. The summary of ideas, plans, progress, and all the details of experiments carried out at SPring-8/SACLA deserves to be called “research results” in the SPring-8/SACLA community. This is why users are required to report all the details of their proposals and results in the Research Report if they are unable to publish their research results in a journal article within seven years after the end of the research term. Some criticize that the current research results publication system discourages the submission of challenging proposals, which I think is a fallacy. We fully understand that challenging proposals do not always produce expected results. The criticism is appropriate if only positive results are required in the research results publication system. However, all the Committee requires of those who are involved in challenging proposals is that they report the efforts they made and the results of those efforts in the Research Report, even when they could not obtain positive results, within seven years after the end of the research term including the extension and re-extension periods. This is a requirement for all approved nonproprietary proposals under the current research results publication system. Regardless of whether the results of their challenges over seven years are positive, negative, or even unclear, a well-organized manuscript providing information about the progress of their research proposals will be considered research results obtained at SPring-8/SACLA and publishable in the Research Report, because such information is helpful to the SPring8/SACLA community. By submitting such a manuscript, users can fulfill their obligation of publishing their research results. Now that the obligation of users involved in challenging proposals has been specified, I expect that the number of challenging proposals submitted will increase but never decrease. The Committee plays a significant role in the current research results publication system. I am uncertain whether users consider the obligation of publishing research results as a burden or as a matter of course, but I would like to ensure that the system reflects the sensibilities of researchers as much as possible. For me it seems reasonable, under the current research results publication system, that users can carry out several experiments during the seven years and bring together, in one journal article, the research results of multiple proposals, and that they are required to submit a manuscript on the progress of their research proposal to the Research Report if they had been unable to publish a journal article within the seven years. Those who criticize this system as seeking too many research results or discouraging challenging proposals may see synchrotron radiation as small science because it is natural for researchers who are involved in small science to desire 100% freedom of research. When we have different views as to whether synchrotron radiation science is small or big, we are arguing on different planes. When you discuss criticisms and suggestions regarding the Committee or the research results publication system, try, at least once, to put aside the inaccurate definition of synchrotron radiation science and imagine that synchrotron radiation science is big science. I strongly feel that the future of the SPring8/SACLA community depends on whether the project leaders who submit proposals to SPring-8 consider themselves to be involved in small or big science. Various thoughts came to mind as I started writing this article at the request of the committee members. As Chair of the Research Results Review Committee in a huge facility, SPring-8/SACLA, I hope this article will help users gain a better understanding of the activities of the Committee, which in turn will contribute to the smooth operation of SPring-8/SACLA.